We arrived on a windy very cold day.The apartment was warm and cosy.Carla is a very nice host.She explained us everything.Darlington town centre is very close (10 minutes walk).Everything is provided in the flat.There were a few beers,wine,Coke and milk in the fridge which we appreciated.We felt like home.We highly recommend this cosy place.We will come back! The lady gave us the ground floor flat which is more baby friendly. I loved the little welcome package and that there were 2 bedrooms. My little boy slept soundly in the travel cot in the second room. It was an easy check in and check out process, flat was lovely and clean, great location for Redworth Hall hotel and plenty of takeaways, pubs, shops nearby. Spotlessly clean; warm. Kitchen well-appointed and a few basics left for us. 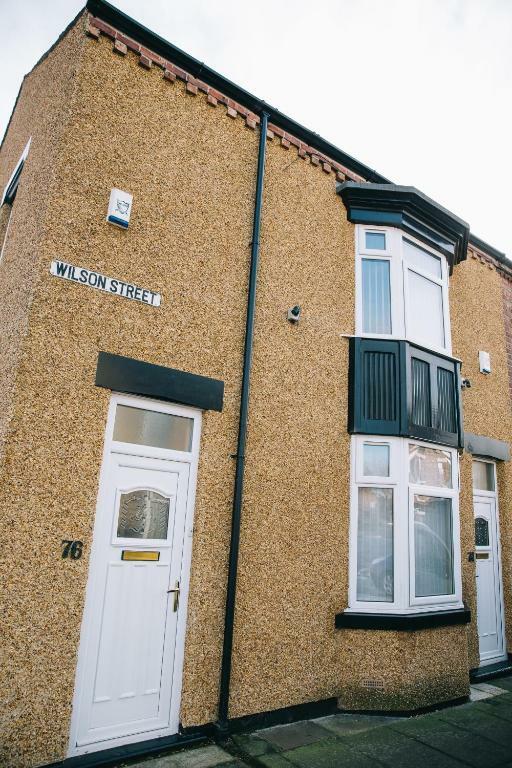 Good location right next to frequent bus to town; short walk to beautiful "Denes" parks, to North Road rail station and to Morrisons; even closer to useful convenience store (1 minute!). Lovely clean apartment, comfy beds , home from home, complimentary wine, lager and milk were nice extras. Corner shops nearby and a short walk down the road is a gorgeous park, with a pathway along the stream. Booked is flat for work colleagues, they were extremely happy and very impressed with the standard and cleanliness. The beds were great and the welcoming beer in e fridge was a bonus. Highly recommended. Have booked here twice now - unfortunately hasn’t been available the other times we’ve needed somewhere in the area! The property has to be one of the best apartments that we have stayed in when visiting Darlington. The property was spotlessly clean, large and was extremely well equipped. On arrival we even received a complementary bottle of wine and beers. It's a very warm flat. The heating is excellent, very controllable, which is great when you've just been out for a blustery walk on the beach! Within minutes of making a reservation on booking.com I was in touch with the property owner and within an hour I was in the apartment having been picked up in the centre of Darlington and taken there by the property manager, Paul. Really impressed by the level of service and by the standard of accommodation, will be staying there again. Lock in a great price for Brinkburn Serviced Apartments - rated 9.6 by recent guests. One of our top picks in Darlington – and a guest favourite. Brinkburn Serviced Apartments offers accommodation in Darlington city centre. The Darlington Arena and railway station are just over a mile away. Each apartment has 2 double bedrooms with extra guest bed available, separate and spacious lounge/dining areas with free WiF and flat-screen TV with cable Freeview channels. A fully equipped kitchen and bathroom with linen, towels, hairdryer and complimentary toiletries are also provided. Darlington town centre is half a mile away and has a variety of shops, eateries and entertainment venues. Darlington Civic Theatre is 0.8 miles away and the A1 motorway is 1 miles away. This property also has one of the best-rated locations in Darlington! Guests are happier about it compared to other properties in the area. 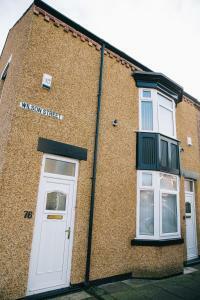 This property is also rated for the best value in Darlington! Guests are getting more for their money when compared to other properties in this city. Brinkburn Serviced Apartments has been welcoming Booking.com guests since 7 Apr 2015. When would you like to stay at Brinkburn Serviced Apartments? This apartment has a stovetop, seating area and kitchenware. This apartment features a sofa, seating area and electric kettle. The whole concept of Brinkburn Serviced Apartments is to provide a "Home from Home". Our aim is to provide a stylish, spacious and private space for our customer's to relax in. Based on our ratings our customer's seem to agree that we have achieved this. The apartments provide most of the comforts you would have at home. A great alternative to the confines of a hotel room at a similar cost. I have been a residential landlord for over 20 yrs in Darlington. I have a portfolio of houses which I rent but was looking for a new challenge. Providing serviced apartments was it. Its different to my other work but enjoyable to meet the different people and characters that visit my home town. Away from the landlord world i'm a busy father and enthusiastic snowboarder! Brinkburn Apartments are within an established residential area within walking distance of Darlington's thriving town centre. There is plenty of amenities close by too: Family pub, park, cinema, Mcdonalds, supermarket, takeaways etc. There is easy access to the A1 Motorway from the apartment for those travelling by vehicle to the property. House rules Brinkburn Serviced Apartments takes special requests - add in the next step! One further older child or adult is charged GBP 10 per person per night in an extra bed. Brinkburn Serviced Apartments accepts these cards and reserves the right to temporarily hold an amount prior to arrival. Please inform Brinkburn Serviced Apartments in advance of your expected arrival time. You can use the Special Requests box when booking, or contact the property directly with the contact details provided in your confirmation. The shower head was wobbly and it smelt a little musty. Great space and location perfect for us. Beds really comfy and warm and lots of hot water. Easy to contact Carla and very friendly service. Nothing. Everything was perfect for a family. Some traffic noise in main bedroom of no. 74. Minor maintenance issue; bathroom door lock came off inside - could be a problem with children; smoke alarm battery needed checking - woke us up bleeping. You can hear the traffic, but that didn’t bother me much. Everything was great!! Thank you!! I got married in Darlington and saw these two apartments next to each other available. £240 over two nights that slept 8 in double beds, so £15 per night per person. Absolutely stunning value for money. I snapped them up for my guests, knowing i had free cancellation with Booking.com. As it turned out they tried Air bnb and couldn't find anything to compete with it. The owner was kind enough to leave the keys in the Bannatyne hotel for collection and we locked up and posted the keys through the letterbox after we were finished. Clean and modern. I don't think you will find value for money like this anywhere.